Perhaps the most compelling example of the transformational impact of INMED’s Health in Action programme, and the epitome of what INMED strives to accomplish with this programme, is from one of the student participants. Khunedi Mashishi was a fifth-grader at Paradise Bend Primary School in Diepsloot, Gauteng when our team at INMED South Africa first met her. 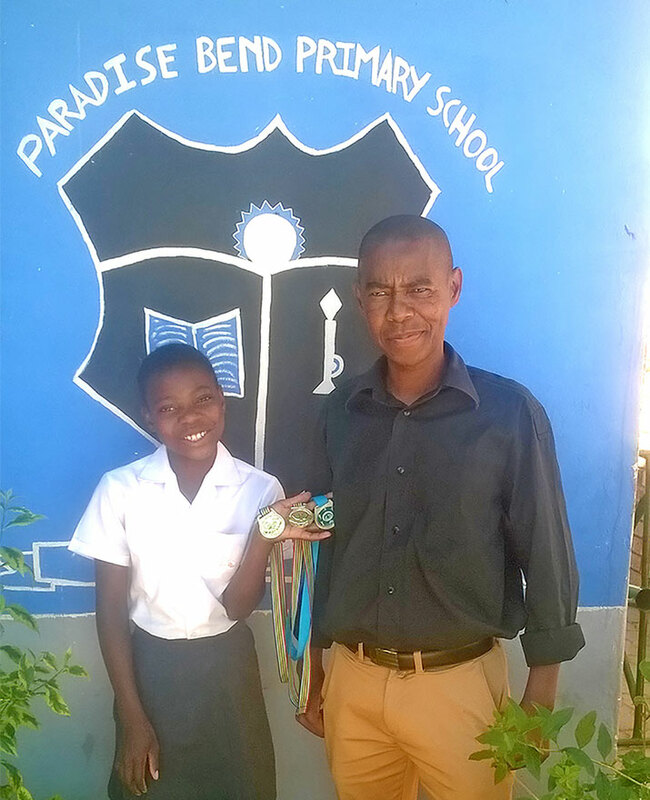 An avid runner, Khunedi has big dreams of competing in the Olympics one day. She has won 32 medals since she started competitive running in 2013. In fact, Khunedi runs so fast that her school mates have nicknamed her Caster after 2016 Olympic Gold Medal runner Caster Semenya. In 2017 She won a regional gold medal and was invited to compete nationally. The child of a single-parent impoverished household, Khunedi was unable to afford the travel and lodging expenses to participate. Thanks to INMED, which covered the expenses and special apparel, Khunedi not only participated but also won the gold in the national event. Since that time, INMED has helped Khunedi secure a scholarship to a boarding school in Johannesburg known for its athletic training programme. Look for Khunedi in the 2020 Olympics. INMED will be cheering her on! Rainbow High School and Repholositswe Secondary School serve students in two impoverished rural communities in Free State, South Africa. Both areas are plagued by violence, and students have few opportunities for extracurricular activities. INMED’s Adaptive Agriculture Programme worked with the schools to create gardens to provide both nutritious food for school meals as well as an outlet to give youth something productive to do after school. In a poor rural community of South Africa’s Free State province, Pietrus Moshoeshoe found himself responsible for 66 extended family members (47 of them children) after his father passed away. He also inherited leadership of his family farming cooperative group. Although Pietrus was learning from his father, he did not possess the same technical knowledge or training in agriculture. The group was struggling desperately, sometimes going up to three days without eating. Since taking part in the agriculture and business training delivered through INMED’s Adaptive Agriculture Programme, however, the group has been able to cultivate their land productively, achieve greater harvests than ever, generate both food and income to nourish their family members every day and send their children to school. 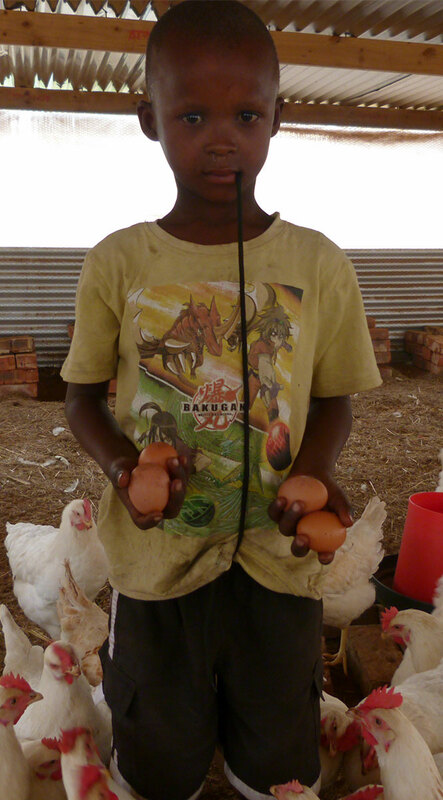 From making approximately R110 – R442 per month from the sales of their meager crops before the programme, they now earn an average of R8,299 monthly year-round from the sale of the group’s produce, eggs and broilers—enough to create a profound impact on their livelihoods. As a result of the business planning and financial training delivered, Pietrus has learned to budget for family needs, maintenance of the farm and eventual expansion of his growing enterprise. He also is actively involved in courses through the local extension service, showing great initiative in increasing his agricultural and business knowledge and strengthening his income generation prospects. “[INMED] really uplifted us. We were suffering a lot… we were not open minded, we did not know about record keeping, we did not know about saving,” Pietrus admits. “INMED has changed our lives a lot because we now know how to keep the records of our project and we now know how to save our money at the bank. “The co-op also has registered its business venture with the provincial government “I see a lot of success in our project and we are going to generate much more profit,” Pietrus says. Indeed, the group has recently been nominated for an award for “most improved” small-scale farmers in the province by the Provincial Department of Agriculture, and are now sufficiently productive that they have hired a member from the community for the first time to help on the farm. Rosie Mateko worked as a teacher in South Africa for 14 years before suffering a severe stroke that left her disabled and forced her to resign from her educational career. It was difficult for Rosie to come to terms with what had happened to her, and she felt a deep sense of loss in addition to the pressure of having to support her four children and two granddaughters as a single, disabled mother. Rosie began talking to other disabled people about empowering themselves, eventually leading the organization of the Monyakeng cooperative group. When INMED first met Rosie, the group was generating some income from sewing, cooking and basic gardening, but the members were still struggling to provide for their families. Through INMED’s Adaptive Agriculture Programme, the implementation of aquaponics—a combination of aquaculture and hydroponics—has opened new opportunities for success for Rosie and the Monyakeng group. Aquaponics is particularly suited to the needs of the disabled, replacing traditional cultivation methods that they are not physically able to perform. Rosie’s leadership was acknowledged when she was named Best Subsistence Producer for her district. Having entered the entrepreneurship competition several times before, she finally gained notice for her work with aquaponics. 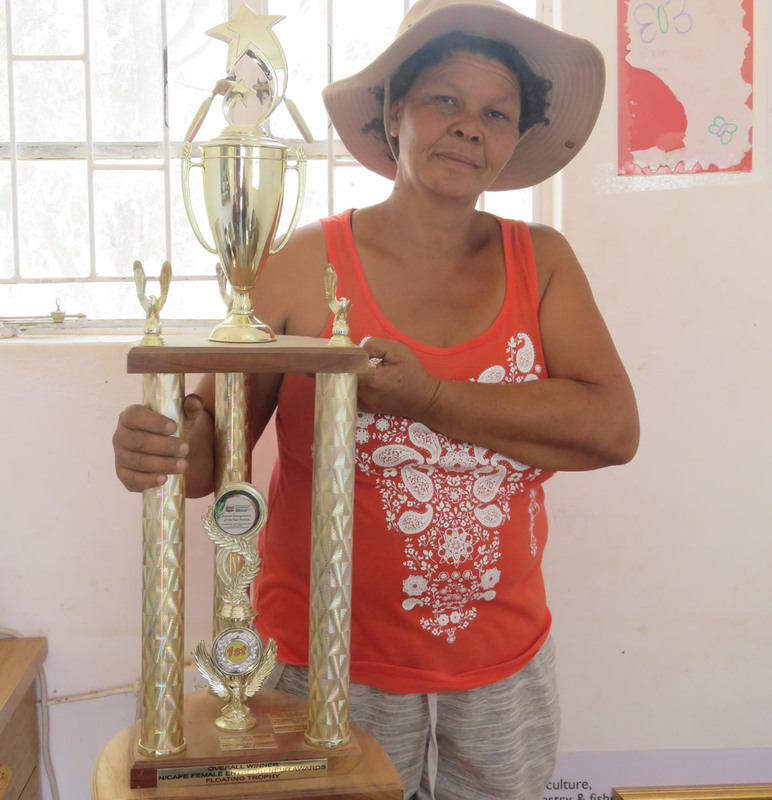 Rosie received a certificate and a cash award, which she invested in the cooperative. The Thabelo Christian Association for the Disabled (a struggling farming cooperative located in a remote mountain village in Venda, Limpopo) works to feed and support an extended household of approximately 40 family members. Each of the cooperative members has physical disabilities, such as missing, deformed or wasted limbs—some as a result of polio. The leader of the group, Wilson Mphaphuli, is married to a woman who is also disabled. The couple has three children, one of whom also has a moderate mental disability. Wilson suffers from a deformed leg as a result of polio, which makes it difficult for him to walk or stand for long periods of time. He has lived in the village for his entire life and worked for a time for a local builder. But when the economy deteriorated, Wilson was let go and has not found employment since. 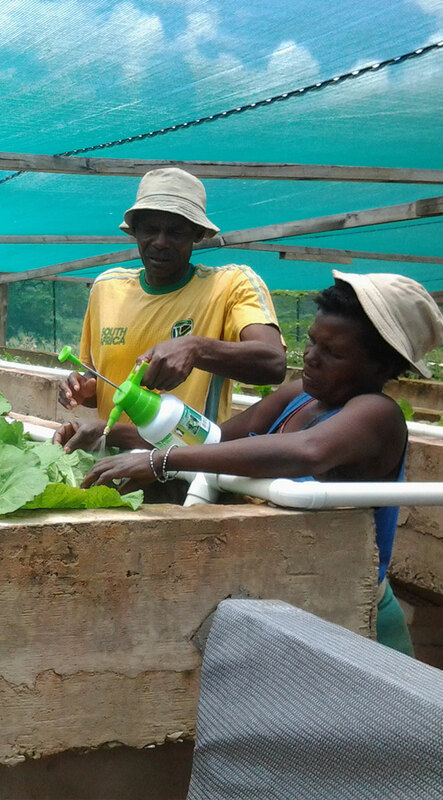 Through INMED’s Adaptive Agriculture Programme, the Thabelo group received a commercial-scale aquaponics system—an innovative, high-yield, simplified technology. INMED also trained the group in more efficient, sustainable traditional agriculture practices. Now, the programme has transformed Wilson’s outlook and his prospects for self-sufficiency. “We now see things in a different way and we now always have hope for a better future, which we didn’t have before,” he says, even in the age of global climate change. When the area was hard-hit by severe storms, all the group’s traditional crops were wiped out by flooding. Yet the aquaponic crops grown in the sturdy, raised and covered cement units were unaffected. Local residents, whose crops were also damaged by the floods, came to the group’s farm every day to buy vegetables, since the Thabelo farmers were the only ones who had fresh produce available. The group has since retained this local market, having built a reputation for quality produce. The Thabelo group’s most notable success over the past year is a more than 50% increase in income compared to the previous year as a result of business planning to guide their investments in new inputs and expansion. The group has also able to create jobs for the community for the first time, hiring temporary workers on a regular basis for physically demanding tasks in their traditional agriculture activities. Educational institutions in disadvantaged communities are increasingly turning to aquaponics to provide more nutritious meals for students, serve as an educational resource and generate income for school operations. Carel De Wet Technical High School in Vanderbijlpark, for example, was the first recipient of an INMED commercial aquaponic system in South Africa. Sponsored by Air Products, this system has produced fresh food and income for the school since 2012. Another Air Products-sponsored aquaponic system is located at Rand Vaal Primary School in Gauteng Province. Installed in 2015, the system has been extremely bountiful, with all the produce used for the school feeding scheme meals. A third aquaponics system and sensory garden were installed by INMED with Air Products in 2017 at Laerskool Kempton Park, a full-service primary school in Johannesburg that also accommodates the needs of children with disabilities. The aquaponic system grow beds and flooring were specially designed to allow wheelchair-dependent students to easily participate in the planting and harvesting activities, as well as the care and feeding of the fish. The sensory garden—featuring a barefoot walking path of various textures, water and sound walls, fragrant fruit trees and vines, brightly colored plants and garden toys—also has proven to be a particularly effective teaching tool and therapeutic resource for students with disabilities. 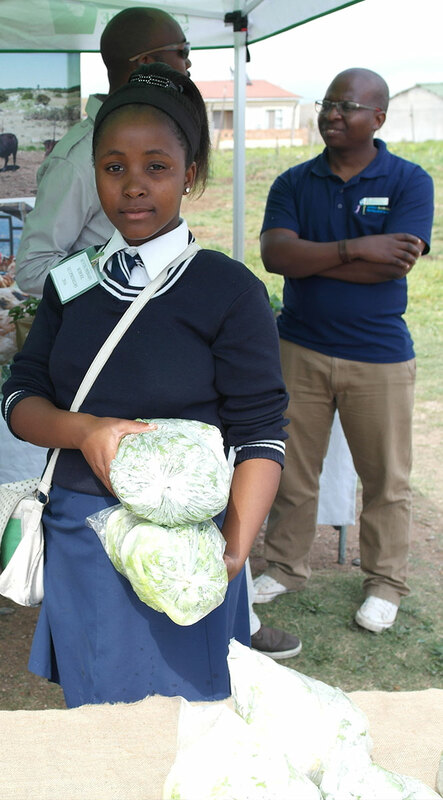 Via INMED’s Health In Action Programme, hundreds of food handlers are trained to incorporate garden produce into school meals is part of INMED’s multi-faceted approach to combating obesity and malnutrition in South Africa. Delivered in three languages, the training focuses on preparing nutritious meals that children will eat, healthy portion sizes, safe food handling and proper hygiene practices. Each year, the 7th grade students in Port Elizabeth are required to start an entrepreneurship initiative as part of their school curriculum. This year, INMED South Africa encouraged Seyisi Primary School to use its Health in Action garden as its entrepreneurship project. The school garden has been a key source of more nutritious school meals as well as an income generator within the community. The students maintain the garden as part of their academic curricula, learning lessons on life science, math, nutrition, sanitation and environmental stewardship. This year, the 7th grade students ran the garden as a business, learning how to develop a business plan, set goals, purchase supplies and inventory, maintain their resources, market their products and generate a profit. At the end of the project, the entire school hosted a Market Day, an event open to the community to purchase their produce, herbs, prepared foods and other items made from the garden’s bounty. The event was also organized to encourage community members to plant their own household gardens for food and income. INMED provided compost, seedlings, potting bags and soil for the school garden, in addition to building a seedling nursery at the school to boost the initiative and to support other nearby schools with seedlings for their Health in Action gardens. The 7th graders set a target to earn R5,000 from this project—with half to be re-invested in the garden and the other half to fund a farewell function for the graduating students. 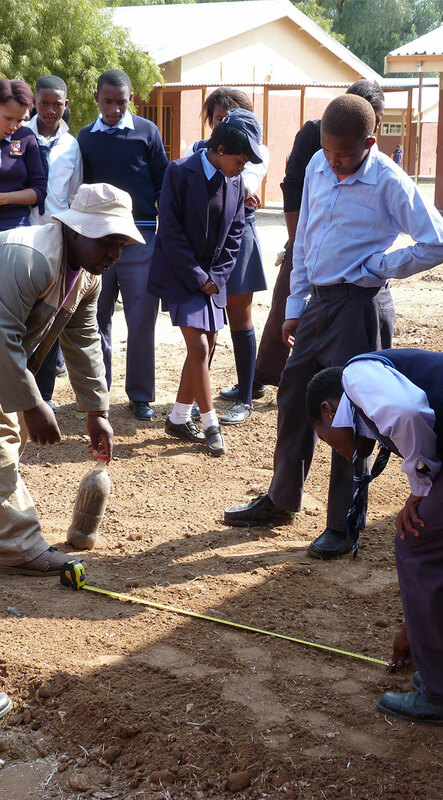 The project was so successful that the students exceeded their target by R3,000. A recent survey indicates that 4 out of 10 children in Johannesburg are obese. One way INMED South Africa is fighting this obesity epidemic is through a new Health in Action initiative called “Break Time Buddies.” Break Time Buddies are unemployed youth who have graduated secondary school and are recruited by INMED via local school governing boards. In partnership with tertiary institutions, such as Nelson Mandela Metropolitan University in Port Elizabeth and Wits University in Johannesburg, they are trained to lead fun physical education activities while promoting nutrition and healthy lifestyles during daily recess at 116 schools. “This programme has enabled me to make a difference in my community. Every time I visit schools I am welcomed by screams of kids competing for my attention,” says Samkelo Dumse, a Break Time Buddy in Kwa-Zakhele schools. 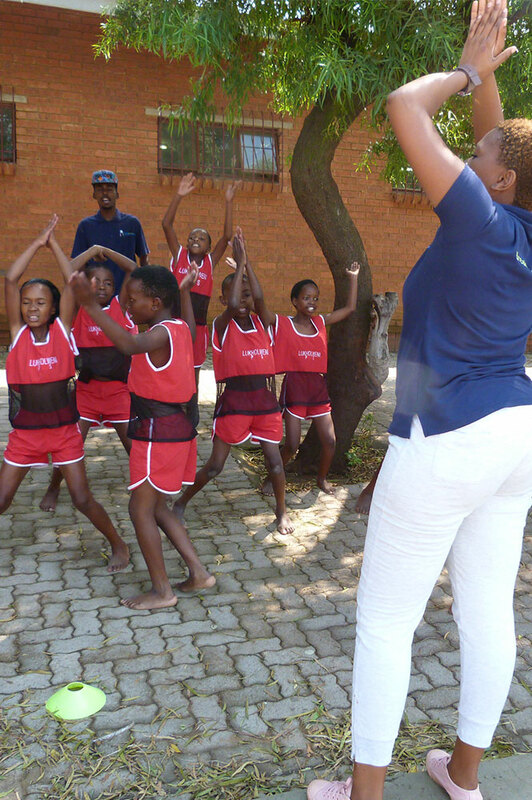 In collaboration with the University of Witwatersrand’s Center for Exercise and Sports Medicine, Break Time Buddies receive classroom and hands-on training on the importance of physical education and strategies for encouraging children to be active. The training is followed by practical, participatory activities on how to prepare and deliver physical education lessons in primary schools. Our Break Time Buddies have played a key role in organizing and demonstrating physical education lessons for teachers and students during class time in selected schools. Prior to these sessions, our local Health in Action programme monitors work closely with each Buddy on how to plan an educational session, followed by an evaluation of their strengths and weaknesses to build their capabilities, professionalism and confidence. As a result, Break Time Buddies are highly regarded in the schools and have sparked the interest of other communities. Life in Pella, Northern Cape is hard. With high unemployment and few options for employment, combined with a prolonged drought, there’s not much hope to go around—unless you know the Pella Food Garden Cooperative. 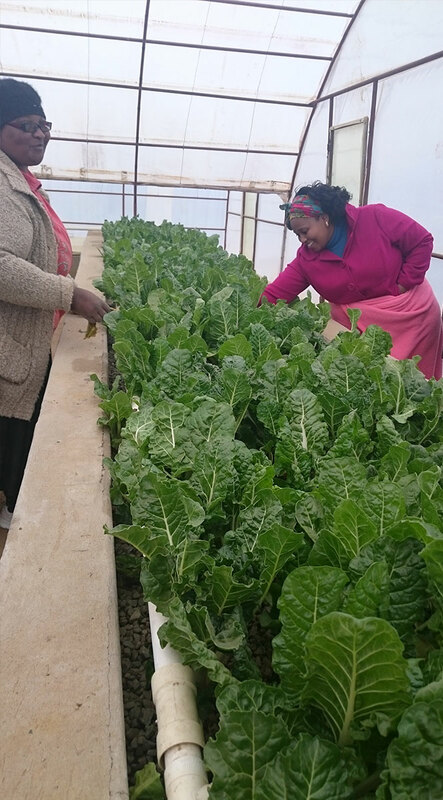 This all-female farming cooperative is the beneficiary of an aquaponics system, adaptive agriculture modifications and business training by INMED South Africa. Only two years ago, the co-op’s members had to rely on government assistance to survive, because they could not produce enough crops to feed their families, let alone earn a sustainable livelihood. 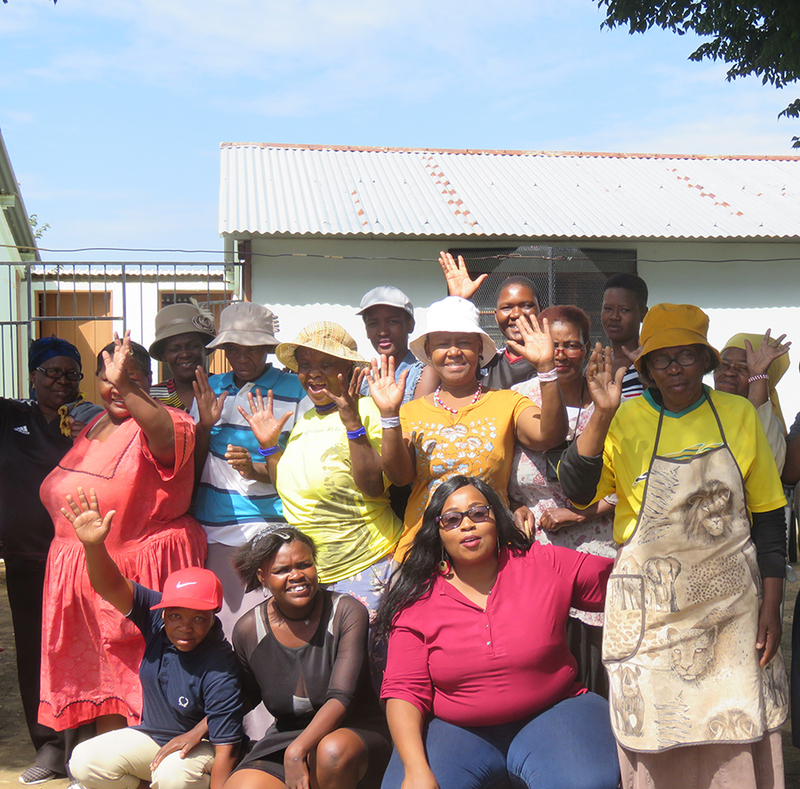 Within a year of working with INMED South Africa, the Pella Food Garden not only increased its income 60-fold, but was named Best Subsistence Producer by the Department of Agriculture, Forestry and Fisheries at the 2018 Female Entrepreneur Awards. The group also was named the Overall Winner of the provincial Female Entrepreneur Awards by the Department of Agriculture in the Northern Cape. It is the first time a contestant from the Northern Cape has won a top national prize. “We feel like proud parents,” said Unathi Sihlahla, Programme Director of INMED South Africa, which helped the co-op implement measures to help the group increase its production capacity to survive the prolonged drought. In partnership with Old Mutual Foundation, INMED South Africa installed a commercial-sized aquaponics system for the Pella Food Garden cooperative as well as agricultural shade cloth for the group’s adaptive agriculture vegetable garden. The INMED team also installed a drip irrigation system and facilitated regular training. With additional funding from the Old Mutual Foundation, the group has added a cold storage unit, a production facility and more shade cloth to expand capacity. In addition to receiving technical training in adaptive agriculture, the Pella co-op members learned computer skills, accounting, business planning, marketing and sales via training from INMED South Africa and Old Mutual Foundation. “Our Adaptive Agriculture programme is unique in that involves the entire value chain—from technical assistance and business training to access to financing and links to ready markets for high-quality produce and fish,” explained Sihlahla. The Pella group’s reputation has spread quickly, becoming a preferred supplier to the public, local retailers, community soup kitchens and schools. Local guesthouses, are negotiating with the Pella Food Garden to provide vegetables and herbs for their guests’ meals. The co-op’s high-quality produce and fish are so much in demand that they are now hiring members of the community to help them keep up. Aquaponics is gaining significant interest as a means for subsistence farmers to adapt to climate change. INMED, however, is taking that a step further to provide food security, better nutrition, skills development and even income generation for schools in low-resource communities. INMED’s aquaponics system at Laerskool Kempton Park, a full-service primary school that also accommodates the needs of children with disabilities, is the third such school-based system INMED Partnerships for Children and INMED South Africa have installed in partnership with Air Products. In addition to the aquaponics system, INMED installed a traditional garden—with a twist. Because many of the students at Laerskool Kempton Park have disabilities or learning challenges, INMED South Africa installed a special sensory garden, featuring a barefoot walking path of various textures, water and sound walls, fragrant fruit trees and vines, brightly colored plants and garden toys. Teachers use the aquaponics system and the sensory garden as teaching tools and therapy for their students. And because aquaponics is not labour intensive and does not use chemicals or fertilizers, the children assist with the planting and harvesting as well as care and feeding of the fish. Teachers repeatedly report that the aquaponics system and sensory garden have been instrumental in reaching children who do not integrate well into traditional classroom settings. And because the aquaponic system is wheelchair accessible, children with physical disabilities may participate alongside children without disabilities in hands-on learning. 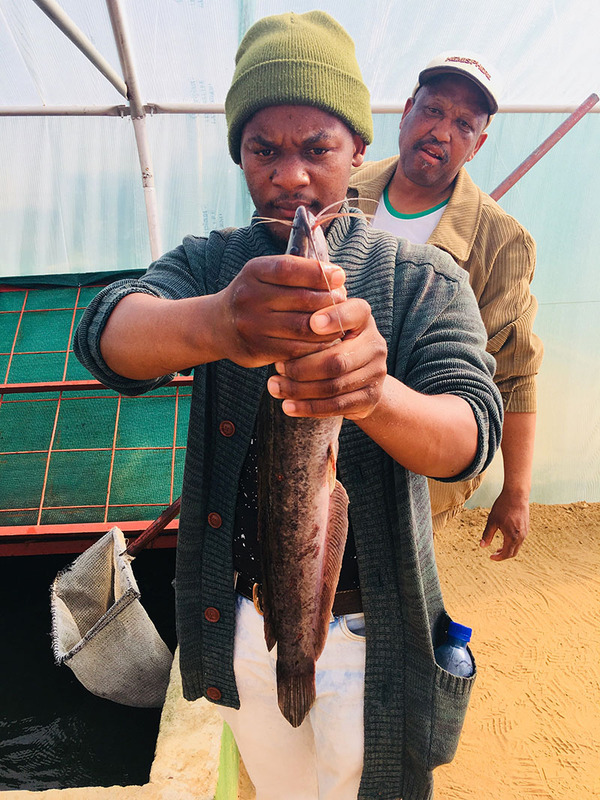 The produce and fish harvested from the system are incorporated into the school’s feeding schemes, with surplus donated to disadvantaged families whose children attend the school. 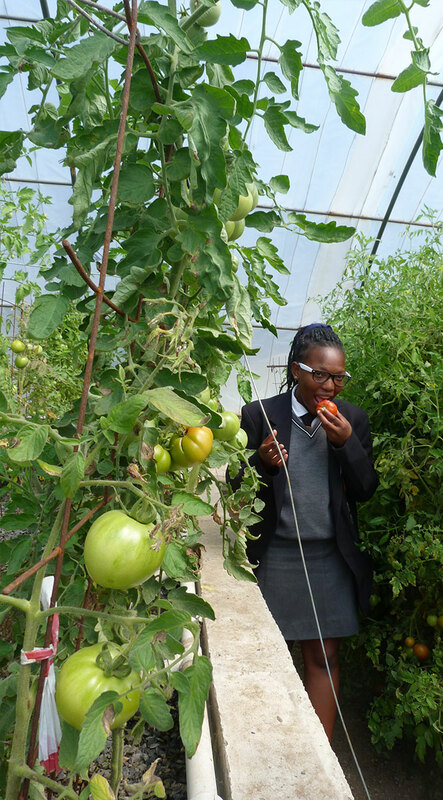 Other school beneficiaries of Air Products and INMED aquqaponics systems are selling surplus produce for income. INMED has partnered with USAID Southern Africa to expand its Adaptive Agriculture Program (AAP) for people with disabilities in the Free State province. The project is integrating people with disabilities into the mainstream economy through new, adaptive agricultural technologies and assisting DPSA in accessing funding for their organisation. “This project not only benefits member agricultural cooperatives, but also increases our capacity as an organization to provide better services to our members,” said Mlungisi Tolie, Provincial Chairperson of the Disabled People South Africa (DPSA) Free State Province. INMED is using aquaponics as a revolutionary approach to the interrelated issues of poverty, food security, nutrition, economic development and exclusion by preparing small-scale producers with disabilities and their communities to adapt to climate change while conserving natural resources and increasing access to economic and technical assets. INMED South Africa has installed two new aquaponics systems in Free State for DPSA member cooperatives in Kroonstadt and Henneman. INMED also upgraded an earlier aquaponics system it installed several years ago in Wesselsbron for the Monyakeng Disabled People South Africa (MDPSA) cooperative. Through the implementation of INMED aquaponics, the cooperative turned a profit for the first time ever. The new USAID-funded program also includes business training, train-the-trainer workshops, intensive collaboration with DPSA’s Free State Provincial Office and community outreach. More than 100 disabled adults with physical and mental disabilities have worked with the farming cooperative since the project was established in November 2018. Following the success of two other projects located close to the Phomolong site, the United States Agency for International Development (USAID) provided funding to INMED to help get this project off the ground. Northern Free State is extremely poor, with more than 70% unemployment since the gold mines closed over a decade ago. “But the successes of the Wesselsbron and Kroonstad projects – each located under 50 miles from the Phomolong township – encouraged the community leaders to look at establishing an aquaponics system,” related Madona. Wilfred Msibi, chairman of the Tshwaranang Disabled People Centre, added that many disabled people earn a very small disability pension which is not enough to sustain themselves, let alone the many blind and disabled children the centre supports. “People from all over the Free State province bring their children here, so we can either feed them or help place them in disabled centres throughout the province,” he explained, commenting that the aquaponics system will not only help provide the necessary nutrition these children need, but also eventually provide a source of income to help develop the local community in general. For now, the people at the centre each have their own job to work on the aquaponics system. 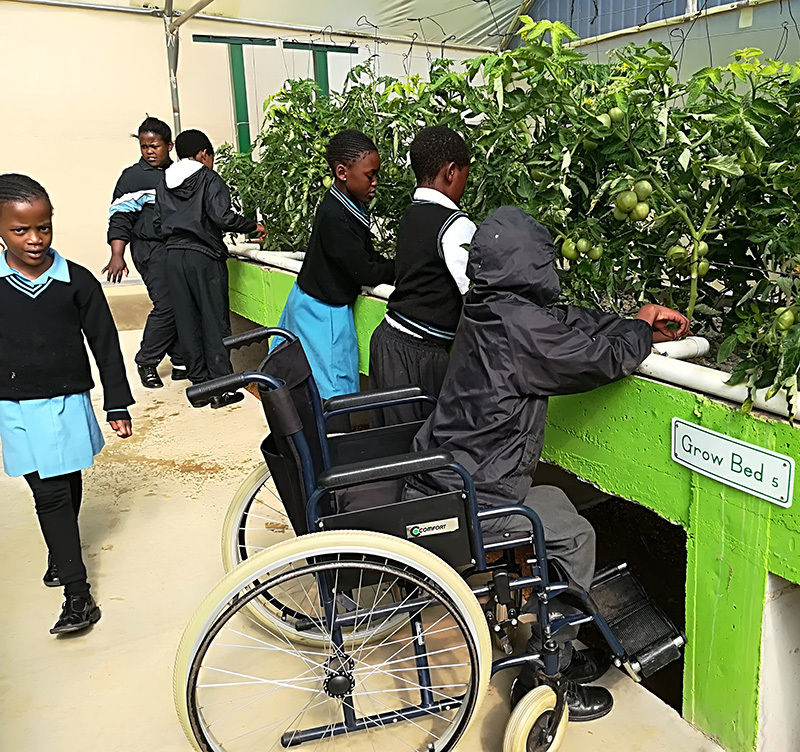 “The system is designed so there is wheelchair access and it is easily accessed by the blind, who will likely be in charge of harvesting when the time comes,” said Msibi.